One of the most interesting and challenging part of cooking is experimenting with flavors and spices, just like the blend of flavors in this Vietnamese-style recipe for Sweet and Sour Potatoes with Mangoes! It was an effort to replicate what we enjoyed at our local Tofu House restaurant. The blend of spices with soy sauce, thai chillies, red pepper, semi-ripe mango and rice vinegar resulted into a winning sauce base for the baby potatoes to be simmered in. The addition of Mango in a curry isn't an idea many would relate to, but try this, and I promise you will love it! Mix all ingredients for the sauce (except cornstarch and water) together and bring to a boil in a small pot. Mix together the cornstarch and water, add to the other ingredients and stir to thicken. You can add more vinegar or water till you achieve your desired consistency. Boil the baby potatoes and dice them into 2 (or you can leave them whole). Prick them with a toothpick so they can be better flavored with the sauce. Chop the mangoes into thin slices and keep aside. Now take a pan, add 2 tbsp vegetable oil, then saute the potatoes in it for some time. Then add the sweet and sour sauce, half of the mangoes and grated ginger, then cover with a lid and let it simmer for 8-10 minutes. Keep stirring in between. Once cooked, check for flavor and consistency of the sauce; add water or seasonings if required. Chop some scallions for garnish. 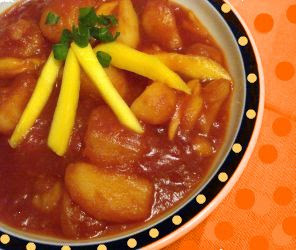 Serve the Baby Potatoes cooked in Sweet and Sour Sauce with Steamed rice. Garnish with remaining chopped mangoes and green onions. that sounds pretty good Mansi! I'd love to give it a try! Now thats original. I love sweet and sour. Just never would have thought to put with potatoes. Very nice. Nicea and tempting colour of the gravy.Well done.I love ur space. Keep experimenting more and give us more such wonderful recipes, Mansi! Looks simply fantastic. I am definitely going to try this. I agree that the best part of cooking is experimenting and coming with new and delicious dishes. I love to do that all the time. Great result you got here. I love mango! Nice experimenting! Looks very tasty and I love the color! mansi, this looks like one of a kind. I really want to try this and check out how it comes out!! Looks so tempting!! thats a lovely recipe...willtry it..
cool combination mansi. Im always on the lookout for unusual combinations of vegetables. Mansi-lovely combo! Drooling at it! It does sound good, and we're both loving our ginger this week! I can't wait until the mangoes are a bit cheaper in the store here. This sounds really tasty! Both sweet and spicy. MMMMMM,...an original & apart recipe!! Surely looks so good, a very interesting combination of mango and potatoes, should try out. This is something I should try! This looks easy and yummy. Thanks for sharing! I have now found something new to do with my mangoes. Potatoes mango..sweet and sour..! !..Interesting, Mansi :)!.. Mangos and potatoes are not something I'd commonly combine together, but I have to say... I may have to give it a shot for this recipe. Just the photo itself looks delicious. Going to give this a try... hopefully my taste buds love it. Hi Mansi! tried it just now with baked green beans and jasmine rice and it was awesome! thanks! !